The aim of this study was to separate antityrosinase compounds of the ethyl acetate fraction from Rhusverniciflua Stokes using medium pressure liquid chromatography. Among the different fractions, the Fr.6 fraction showed the highest antityrosinase capacity (96.5%), followed by the Fr.5 fraction (85.6%). The Fr.1 fraction showed the lowest antityrosinase capacity (12.4%). Bioactivity-guided fractionation of Fr.5.5 and Fr.6.4 led to the isolation and identification of butin and sulfuretin. Then the inhibitory effects of butin and sulfuretin on the monophenolase and diphenolase activity of mushroom tyrosinase were investigated. 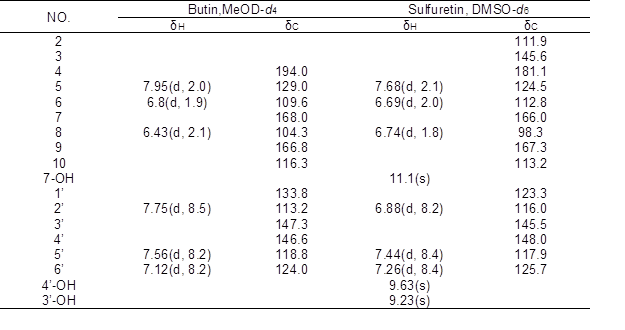 The results showed that butin and sulfuretin can act as potent inhibitors of monophenolase and diphenolase activities of the enzyme, and the IC50 of the butin and sulfuretin were 16.0 μmol/L and 13.64 μmol/L, respectively. The lag period of the enzyme was obviously lengthened; it was estimated to be 1 min in the absence of inhibitor, extended to 26 min in the presence of 185 μmol/L of butin, and 6 min in the presence of 111.1 μmol/L of sulfuretin. A kinetic analysis showed that butin and sulfuretin are competitive inhibitors. The results revealed that the butin and sulfuretin took up the loci of the substrate combined with enzyme, or blocked the anionic initiation by eliminating free radicals, thus weakening the catalytic reaction of oxidation of L-dopa. The aim of this study was to separate antityrosinase compounds of the ethyl acetate fraction from Rhus verniciflua Stokes using medium pressure liquid chromatography. Among the different fractions, the Fr.6 fraction showed the highest antityrosinase capacity (96.5%), followed by the Fr.5 fraction (85.6%). The Fr.1 fraction showed the lowest antityrosinase capacity (12.4%). Bioactivity-guided fractionation of Fr.5.5 and Fr.6.4 led to the isolation and identification of butin and sulfuretin. Then the inhibitory effects of butin and sulfuretin on the monophenolase and diphenolase activity of mushroom tyrosinase were investigated. The results showed that butin and sulfuretin can act as potent inhibitors of monophenolase and diphenolase activities of the enzyme, and the IC50 of the butin and sulfuretin were 16.0 μmol/L and 13.64 μmol/L, respectively. The lag period of the enzyme was obviously lengthened; it was estimated to be 1 min in the absence of inhibitor, extended to 26 min in the presence of 185 μmol/L of butin, and 6 min in the presence of 111.1 μmol/L of sulfuretin. A kinetic analysis showed that butin and sulfuretin are competitive inhibitors. The results revealed that the butin and sulfuretin took up the loci of the substrate combined with enzyme, or blocked the anionic initiation by eliminating free radicals, thus weakening the catalytic reaction of oxidation of L-dopa. Rhus verniciflua Stokes is a deciduous tree of the Anacardiaceae family in the toxicodendron category, and it has been a source of traditional herbal medicine in East Asia (Zheng and Min 1980; Fu et al. 2005). The extracts of Rhus verniciﬂua stokes have pharmacological activity such as anti-tumor activity (Lee et al. 2004), antioxidant activity (Lim et al. 2001), anti-microbial activity (Kim et al. 2010), and immunoregulation function (Kang et al. 2012). Butin (7,3’,4’-trihydroxydihydroﬂavone, Fig.1a) and sulfuretin (3′,4′,6-trihydroxyaurone, Fig. 1b) are the major bioactive components in Rhus verniciﬂua Stokes. Butin has biological activities such as skin-whitening, anti-implantation activity (Lee et al. 2006), and anti-oxidative DNA damage (Kang et al. 2009). Sulfuretin has been used to reduce oxidative stress, platelet aggregation, and mutagenesis (Lee et al. 2002; Park et al. 2004; Jeon et al. 2006). Therefore, the pharmacological and physiological activities of butin and sulfuretin and their applications are currently attracting great interest. Tyrosinase (EC 1.14.18.1) is a phenoloxidase and also a copper metal oxidase, which exists widely in microorganisms, plants, animals, and in the human body (Mayer 1987; Sanchez-Ferrer et al. 1995). In medicine, the excessive expression level of tyrosinase can lead to pigmentation disorders, such as chloasma, age spots, and freckles (Frenk 1995). The degradation of tyrosinase can lead to depigmentation diseases, such as poliosis and vitiligo (He and Qin 1994). In the food industry, tyrosinase is the key enzyme that controls the enzymatic browning of fruits and vegetables (Friedman 1996). The browning reaction produced by quinone compounds causes the amino and thiol irreversible reaction of protein. Therefore, the development of the beneficial, effective tyrosinase inhibitors has gained widespread attention. Medium-pressure liquid chromatography (MPLC) is a preparative column chromatography technique in which the applied pressure is between 5 and 10 bars. It is rapid and convenient for purifying the synthetic products and natural product mixtures (Morini et al. 2008; Mohn et al. 2009). The polarity of flavonoids of the ethyl acetate fraction is similar; it is separated with difficulty from Rhus verniciﬂua Stokes by silica gel chromatography. In the present study, under the bioactivity-guided method, butin and sulfuretin of the ethyl acetate fraction were rapidly isolated by MPLC. The isolates showed the excellent inhibitory on the tyrosinase activity. The kinetic study on the inhibition of the diphenolase activity was carried out, and then the kinetic parameters were evaluated. The results were promising for Rhus verniciﬂua Stokes, justifying a more detailed investigation of their antityrosinase properties and application possibilities. Rhus verniciﬂua Stokes wood was harvested from HuBei Province (China), dried at room temperature for two weeks, crushed into a powder, sieved to select particles smaller than 1 mm, and stored in desiccators. Ethanol, methanol, ethyl acetate, petroleum ether, phosphate buffer solution (0.1 mmol/L; pH 6.8), L-tyrosine, L-3,4-dihydroxyphenyl-alanine (L-dopa), acetic acid, MeOD-d4, and DMSO-d6 were purchased from Sinopharm Chemical Reagent Co., Ltd. (China). Tyrosinase (EC 1.14.18.1) from mushroom was purchased from the Sigma-Aldrich Chemical Co. (China). The specific activity of the enzyme was 5771 U/mg. The MPLC system (Büchi, Flawil, Switzerland) included a model C-615 pump and C-615 pump manager, C-630 UV monitor and a C-660 fraction collector. The analysis was carried out on a plastic and glass column (30 × 300 mm) packed with silica gel Si60 (40 to 100 μm) or reversed phase 18 (30 μm), at a flow rate of 10 mL/min, with detection at 280 nm, the concentration of the sample solutions was 200 mg/mL. For the mobile phase: for silica gel filler, different ratios of petroleum ether (A) and ethyl acetate (B) were used; for the reversed phase C18 filler, different ratios of methanol (A) and 0.5% acetic acid (B) were used. The high-performance liquid chromatography (HPLC) analyses were performed on a Shimadzu SPD-20A with a PDA detector and controlled with class-up station (Shimadzu Co. Ltd., Japan). The separations were made on a reversed phase-18 end-capped column (4.6 × 250 mm, 5 μm). The mobile phase consisted of methanol (A) and 0.5% acetic acid (B). From 0.1 to 10 min, 65% B was used; from 10 to 25 min, 50% B was used; from 25 to 50 min, 25% B was used; and from 50 to 60 min, 10% B was used. The flow rate was 1 mL/min. The injection volume was 20 μL, and the concentration of the sample solutions was 5mg/mL. The dried woods of Rhus verniciﬂua Stokes were extracted with 80% ethanol-water solution at 70 °C for 1 h. Solids were separated by filtration, and the filtrate was dried by rotary evaporator then partitioned with petroleum ether, ethyl acetate, and n-butanol. The ethyl acetate extract showed the strongest inhibitory activity against the tyrosinase. Then the ethyl acetate extract was isolated using MPLC, and it was chromatographically separated on silica gel with a petroleum ether-ethyl acetate solvent (10:0, 9:1, 8:2, 7:3, 6:4, 5:5, 4:6, 3:7, 2:8, 1:9,0:10) to give eleven fractions (Fr.1 to Fr.11). The fractions Fr.5 and Fr.6 were rechromatographed on a RP-C18 column, eluting with water-methanol (95:5, 90:10, 80:20, 70:30, 60:40, 50:50, 40:60, 30:70, v/v) to give sixteen fractions (Fr.5-1 to 8) and (Fr.6-1 to 8). The fractions Fr.5-5 and Fr.6-4 were dried by rotary evaporator to give compounds 1 and 2. The structures of the compounds were identified using infrared (IR), mass spectrometry (MS), and nuclear magnetic resonance (NMR) spectroscopy. where A1 is the absorbance at 492 nm with enzyme, but without test sample; A2 is the absorbance at 492 nm, with test sample and enzyme; and A3 is the absorbance at 492 nm, with test samples but without enzyme. The butin was dissolved in dimethyl sulfoxide solution at 7.4, 18.5, or 185 μmmol/L. The sulfuretin was dissolved in dimethyl sulfoxide solution at 1.85, 14.8, or 111.1 μmmol/L. Then, 100μL of L-tyrosine (1 mM) or L-dopa (1 mM) were added to wells of a 96-well plate, and 70 μL of different concentrations of extract solution were added. The reaction was incubated for 2 min at 30 °C; 30 μL of mushroom tyrosinase was added to the first and second mixture solutions, and the mixture was monitored with a microplate reader at 492 nm from 1 to 30 min. A Lineweaver–Burk plot was drawn using Eq. 2. With different concentrations of substrate, the reaction velocities were determined using 1/[S] as the abscissa and 1/V as the ordinate to produce a straight line, from which the Km and Vmax values were then calculated. Thus, the inhibition mode was assayed. In Eq. 2, Vm is the biggest reaction velocity of enzyme, S is the concentration of substrate, Km is the Michaelis constant, and V is the initial velocity of the enzymatic reaction. The inhibitory effects of the ethyl acetate fraction from Rhus verniciﬂua Stokes of ethanol extract on tyrosinase were previously reported (Chen et al. 2014).The aim of the present article was to fractionate the anti-tyrosinase effects compounds through bioactivity-guided methods. The main compounds of the ethyl acetate fraction were fisetin, fustin, garbanzol, sulfuretin, butin and quercetin (Kim et al. 2010; Park et al. 2004). In past studies the most commonly used methods have included repeatedly performing silica gel column chromatography, and the separation process was long. At the selected pressure, natural product mixtures were separated rapidly by MPLC, thus shortened the separation time and greatly improving the separation effect. Figure 2 shows an HPLC chromatogram of an ethyl acetate fraction, in which the peak at 32 min corresponded to fisetin, 36.6 min was for sulfuretin, and 40 min was due to butin. In summary, various compounds were well separated on HPLC. The ethyl acetate extract was isolated using MPLC with a petroleum ether-ethyl acetate solvent (10:0, 9:1, 8:2, 7:3, 6:4, 5:5, 4:6, 3:7, 2:8, 1:9,0:10) to give 11 fractions (Fr.1 to Fr.11). The inhibitory effects for the 11 fractions were tested (Fig. 3), and the inhibition rate of 11 fractions varied from 12.4% to 96.5%. The Fr.6 fraction showed the highest antityrosinase capacity (96.5% of inhibition of tyrosinase activity), followed by the Fr.5 fraction (85.6%), Fr.2 fraction (79.5%), Fr.7 fraction (74.4%), and Fr.11 fraction (68.5%). The Fr.1 fraction showed the lowest antityrosinase capacity (12.4%). 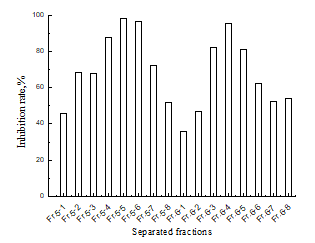 Results of HPLC analysis of the MPLC fraction Fr.5 and Fr.6 are shown in Figs. 4 and 5. The main compounds in Fr.5 were sulfuretin and butin, and the main compounds in Fr.6 were sulfuretin and fisetin, which showed that the sulfuretin, butin, and fisetin may be the main compounds contributing to the anti-tyrosinase activity. The Fr.2 fraction belonged to the low polarity components, which may contain urushiol. Urushiol is an oil found in the sap of the Rhus verniciﬂua stokes which has an excellent effect in a wide variety of fields, including anti-tumor, and anti-bacteria activity (Dong et al.1999; Suk et al. 2011); however, it causes an allergic skin rash. The fractions Fr.5 and Fr.6 were rechromatographed on a reversed phase C18 filler with a water-methanol solvent (95:5, 90:10, 80:20, 70:30, 60:40, 50:50, 40:60, 30:70, v/v), and the inhibitory effects for the sixteen fractions of Fr.5 and Fr.6 were tested (Fig.6). The inhibition rate of eleven fractions varied from 35.8% to 98.2%, and three fractions showed a very high inhibition rate: Fr.5.5 (98.2%), Fr.5.6 (96.5%), and Fr.6.4 (95.7%), respectively. HPLC analysis of the MPLC fractions Fr.5.5 and Fr.6.4 are shown in Figs.7 and 8. The two fractions were evaporated, Fr.5.5 was yellow powder (Compound 1), and Fr.6.4 was orange powder (Compound 2). A targeted preparative was isolated by MPLC on reversed phase C18 column to give two compounds. The structures of the compounds were identified using IR, MS and NMR spectroscopy, and by comparison with published data (Kim et al. 2010), which were butin and sulfuretin. Compound 1 was obtained in the form of a yellow powder with a molecular ion peak at m/z 271[M-H]–, which reflects a molecular formula of C15H12O5. IR: 3300, 2966, 1638, 1594, 1557, 1514, 1444, 1354, 1235, 1315, 1148 cm-1, UV/Vis λmax (MeOH): 221, 261, 371 nm. The NMR data of compound 1 are shown in the Table 1. The 1H-NMR data for compound 1 showed signals for three meta-coupled protons at δ 7.95 (1H, d, J=2.0Hz, H-5), δ 6.8 (1H, d, J=1.9Hz, H-6), and δ 6.43 (1H, d, J=2.1Hz, H-8), together with three ortho-coupled protons at δ 7.75 (1H, d, J=8.5Hz, H-2’), δ 7.56 (1H, d, J=8.2Hz, H-5’), and δ 7.12 (1H, d, J=8.2Hz, H-6’). Accordingly, the structure of compound 1 was elucidated as butin by comparison with spectral data in the literature (Kim et al. 2010). Compound 2 was obtained in the form of an orange powder with a molecular ion peak at m/z: 269[M-H]–, which reflects a molecular formula of C15H10O5. IR: 3321, 1597, 1516, 1456, 1370, 1287, 1134 cm-1, UV/V is λmax (MeOH): 206, 257, 387 nm. The 1H NMR spectrum of compound 2 exhibited three hydroxy at δ 11.1 (1H, s, 7-OH), δ 9.63 (1H, s, 4’-OH), and δ 9.23 (1H, s, 3’-OH), three meta-coupled protons at δ 7.68 (1H, d, J=2.1Hz, H-5), δ 6.69 (1H, d, J=2.0Hz, H-6), and δ 6.74 (1H, d, J=1.8Hz, H-8), together with three ortho-coupled protons at δ 6.88 (1H, d, J=8.2Hz, H-2’), δ 7.44(1H, d, J=8.4Hz, H-5’), and δ 7.26 (1H, d, J=8.4Hz, H-6’). Accordingly, the structure of compound 2 was elucidated as sulfuretin by comparison with spectral data in the literature (Kim et al. 2010). Butin and sulfuretin were investigated for their anti-tyrosinase activity, which was examined using mushroom tyrosinase with L-tyrosine as a substrate. 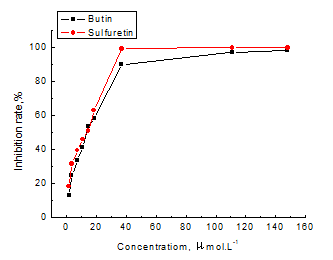 Figure 9 shows the inhibitory rate of the different concentrations of the butin and sulfuretin. The inhibitory effects depend on the concentrations of butin and sulfuretin; when the concentration increased, the inhibition rate also increased. where Y is the inhibition rate of the compound (%) and X is the concentration of the compound (μmol.L-1). The coefficients of determination of butin and sulfuretin were 0.969 and 0.983, respectively. According to the equation, the calculated values of IC50 of butin and sulfuretin were 16.0 μmol.L-1 and 13.64 μmol.L-1, respectively. To investigate the impact of the entire dopachrome formation process by compounds, the reaction with compound, tyrosine, and tyrosinase was monitored with UV-vis spectra. The scan speed was observed at 2 min intervals for 30 s, and the results are shown in Fig. 10. The characteristic peak of the sopachrome on the UV/vis absorption spectrum was 492 nm. From the figure, the dopachrome of the contrast (without compounds) increased with time and the color of liquid was noted to fade within 12 min. With the addition of the compounds (butin and sulfuretin), the dopachrome was only slightly increased, indicating the compounds had a potent inhibitory effect on the formation of the dopachrome. The characteristic peak of butin on the UV/vis absorption spectrum was 221, 261, and 371 nm. The characteristic peak of sulfuretin on the UV/vis absorption spectrum was 206, 257, and 387 nm. From the figure, the UV/vis absorption spectrum changed rapidly, and the characteristic shift to short wavelengths was observed. This phenomenon is similar to quercetin (Kubo et al. 2004). Absorbance at 387 and 371nm mainly comes from the n→π* transition. So, the shift of the absorption may be caused by structural changes, and it was preliminarily concluded that the compounds reacted with tyrosinase. In the process of the hydroxylation of monophenolase by tyrosinase, there exists a hysteresis effect, due to the larger steric hindrance of tyrosinase, and this affects the enzymatic activity. In order to study the monophenolase activity of the compounds, L-tyrosinase was used as a substrate. The kinetic course for the oxidation of the substrate in the presence of butin and sulfuretin is shown in Fig. 11. The tyrosinase inhibition of the compounds were positively related with concentration. The lag time of monophenolase activity is shown in Table 2. The lag period increased markedly with an increase in the concentration of butin. The lag period of the enzyme did not change with increasing concentration of sulfuretin. When butin was present in the enzyme reaction system, it obviously influenced enzyme activity. The L-tyrosinase combined with the enzyme active site difficultly, then extended the hysteresis time. In order to determine the inhibitory type of butin and sulfuretin on the diphenolase activity, the L-dopa was used as the substrate, and the inhibitory kinetics of mushroom tyrosinase on diphenolase were studied. 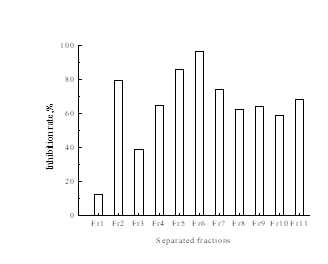 Figure 12 showed the Lineweaver-Burk plots of butin (Fig. 12a) and sulfuretin (Fig. 12b). The values of Km and Vm can be obtained from the slopes and the intercepts, respectively (Han et al. 2008). The results from Fig. 12 showed that butin and sulfuretin were competitive inhibitors. The plots of 1/Vss versus 1/[S] gave a family of straight lines with different slopes, but they intersected one another at the ordinate. The values of Vmax remained the same and the values of Km increased with increasing concentrations of the inhibitor. This illustrated that the butin and sulfuretin could bind with free enzyme; it took up the loci of the substrate combined with enzyme, and thus weakened the catalytic reaction of oxidation of L-dopa. The inhibitory effects on monophenolase and diphenolase with L-tyrosine and L-dopa as a substrate showed that butin and sulfuretin had potent inhibitory effects. Tyrosinase is a copper(II) metalloproteinase with two dinuclear copper ions located on the spiral beam of the active center. The excessive copper ions in the compound solutions were added in order to confirm that the butin and sulfuretin bind the copper irons in the active site of the tyrosinase, and the results are shown in Fig. 13. From the figure, the UV/vis absorption spectrum of the compound and tyrosine changed rapidly. The characteristic shift to short wavelengths was observed, which means that the chemical structures of the compounds were changed in the process of tyrosinase inhibition. The UV/vis absorption spectrum of compound and compound with copper ions matched perfectly; this means that the compound did not bind with copper ions of tyrosinase, thus demonstrating the inhibitory activity. Butin and sulfuretin are the flavonoids, which contain pyrocatechol structure, and they have potent antioxidant activity and anti-viral activity (Kang et al. 2012). The research showed that butin and sulfuretin are competitive inhibitors, and are not be combined with the copper ions of tyrosinase. Thus, it can be concluded that the butin and sulfuretin act as the antioxidants to resist oxygen activating tyrosinase. In the process of catalytic oxidation of tyrosinase, the superoxide anion free radical (O2–·) was both an initiator and reactant. The butin and sulfuretin in the process can effectively remove O2–·, and block the anionic initiation, thus reducing the tyrosine enzyme catalysis. The separation, identification, and inhibition activity of tyrosinase of the complex ethyl acetate fraction from Rhus verniciﬂua stokes were conducted in the present study by MPLC, and performed on pre-packed silica gel and reversed phase C18 plastic and glass column. Tests were carried out under the following conditions: flow rate of 10 mL/min, mobile phase: petroleum ether (A) and ethyl acetate (B) (silica gel); water (A) and methanol (B) with 0.5% acetic acid (reversed phase C18), detection at 280 nm; the butin and sulfuretin were separated rapidly and efficiently. Inhibiting tyrosinase activity results showed that butin and sulfuretin exhibited both monophenolase and diphenolase inhibitory activities on mushroom tyrosinase. The kinetic analysis revealed that butin and sulfuretin were competitive inhibitors of mushroom tyrosinase. Butin and sulfuretin were not combined with the copper ions of tyrosinase from the UV-visible spectrum, which revealed that the butin and sulfuretin took up the loci of the substrate combined with enzyme or blocked the anionic initiation through by eliminating free radicals, thus weakening the catalytic reaction of oxidation of L-DOPA. The present study revealed a potential usage of butin and sulfuretin, contributing to the knowledge of understanding the interaction between tyrosinase and its inhibitors. We are grateful to “948” Technology Introduction Project (2015-4-46), International Science & Technology Cooperation Program of China (2014DFR31300), and Basic Scientific Research Funds of Research Institute of Forestry New Technology, CAF (CAFINT2013C03) for financial support. Chen, H. X., Wang, C. Z., and Ye, J. Z. (2014). “Inhibitory effect of the ethyl acetate fraction of ethanol extract from Rhus verniciflua Stokes wood on the activity of mushroom tyrosinase,” BioResources 9(4),7243-7256. Frenk, E. (1995). “Treatment of melasma with depigmenting agents,” in: Melasma: New Approaches to Treatment, Martin Dunitz, London. Friedman, M. (1996). “Food browning and its prevention: An overview,” J. Agric. Food Chem. 44, 631-653. 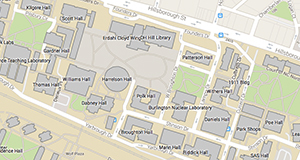 Fu, S. Y., Wei, S. N., and Hu, Z. H. (2005). “The research progress of biological from Rhus verniciflua Stokes,” Chinese. Wild. Plant. Resources 24(5),12-16. He, X. M., and Qin, D. A. (1994). “China cosmetics review,” Melanin and Tyrosinase 3, 32-33. Zheng, M., and Min, T. L. (1980). Flora of China – Anacardiaceae, Science Press, Beijing. Article submitted: August 26, 2015; Peer review completed: November 7, 2015; Revised version received: November 9, 2015; Accepted: November 10, 2015; Published: November 25, 2015.